New kitchen gadgets are invented and released onto the market more often than we have hot dinners, so if you're buying a gift for someone who likes to cook you have an ever changing selection of things to choose from. In an ideal world, a kitchen gadget makes life easier – for example, a toaster will do a quicker and better job at toasting your bread than putting it under the grill every morning. Then there’s the lifestyle changes: juicers, blenders and coffee machines all help us to feel more awake and healthy. And then there are the kitchen gifts that the recipient just wants. They may need it, they may not. But it’s so hard to resist when it can boil, poach or even rustle up an omelette for you without you having to lift a finger. Below, we’ve brought you a selection of best kitchen gifts to give this year. Whether it's a theatrical coffee machine, a solution for healthy eating, or just something really cool, these five gifts are sure to be well received. Forget Starbucks, Costa or your local indie coffee bar, Heston Blumenthal has entered the industry, and it’s in the form of this crazy piece of home barista gadgetry. There’s an in-built grinder with 18 settings so you can produce perfectly ground coffee, there’s a pre-infusion process where coffee is allowed to soak and expand to release the full potential of its flavour, then there’s a high power steamer for frothing up the milk for lattes, cappuccinos and macchiatos. And the list goes on. Reviewers claim that the coffees they make with this machine taste better than anything they’ve ever had in a coffee shop, so this is definitely one for the coffee enthusiast's kitchen. This citrus juicer is cool, well-made and apparently very quiet. There’s a built in sensor which means the motor doesn’t start spinning until you’ve pressed the fruit to the device and the spout is anti-drip so you shouldn’t have to clear up any sticky marks from the countertop. Its three removable parts are dishwasher safe, too, which makes cleaning up easy, even for the laziest of people. With this nifty gadget, you can cook up four hard or soft boiled eggs, two poached eggs or an omelette. Not bad for an RRP of £20. Reviewers are pleased with the overall performance of the gadget – just bear in mind that you may have to fiddle with the amount of water you use so you can achieve the perfect egg for your liking. 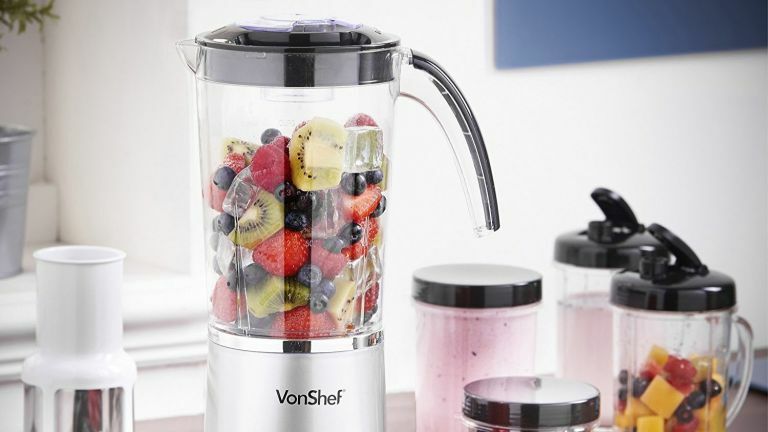 If you’re looking for a gadget that packs in as many functions as possible, this blender could become the perfect addition to a countertop. Whip up a Saturday morning smoothie or a daily glass of orange juice. Coffee drinkers can grind up their favourite bean, while aspiring chefs can experiment with salad dressings. Unlike the Heston coffee machine or the Smeg Citrus Juicer, it’s not a pro at one specific thing – so don’t expect the finesse that other specifically designed machines can deliver. Still, for multi-purpose, it’s a winner. Yes, there are thousands of toasters on the market that are cheap, cheerful and do the job just fine, but how many times have you burnt your toast because someone else has changed the settings? And how do you know when your crumpet is toasted just to your liking without pressing the cancel button or peering into the top as you sear your eyeballs in the heat? What's needed is a toaster where you can watch the toast brown until it's just how you want it. Style hasn’t vetoed substance, either – reviewers say that it’s toasting qualities and usability are decent, too.